What are the Benefits of Solar Roof Vents? The great Mother Nature has always been here since forever to bring us cost-effective and environmentally friendly solutions for everything. Solar energy is a great blessing with miraculous benefits. If you want to save your hard earned money and this precious environment, buying a solar powered roof vent is a perfect idea. It’s time to say goodbye to your conventional electric roof vents. 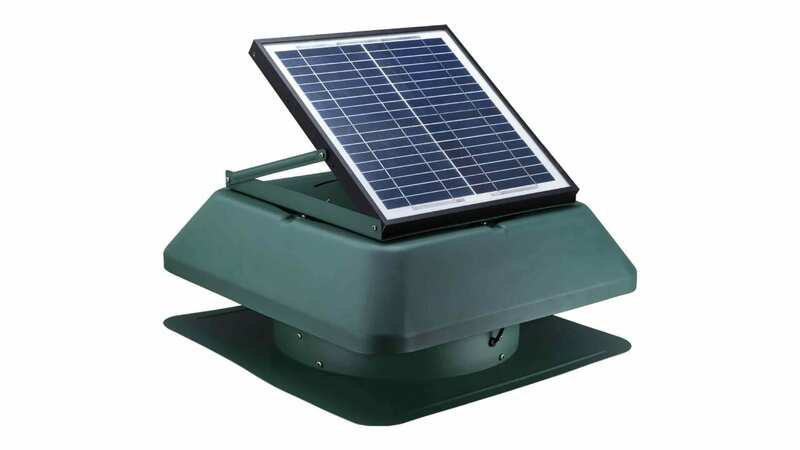 A solar roof vent comes with safer, cleaner and much efficient performance. Undoubtedly, electricity is the most commonly used source of electricity on this planet. It is convenient to use for a common man. Moreover, it is widely incorporated into our lifestyle in countless ways. All appliances that have made our life effortless and easy are functional by the virtue of this electricity. But there is a cost of every ease and comfort in life. Similarly, today the cost of electricity has reached significantly higher costs after making our lifestyles much easier. So, the world is looking for ways to explore the best alternative ways. You can never thank technological advancement enough; today it has developed a huge range of things that are operable with solar energy. Solar lights, solar vents, and solar fans are just a few of these appliances that are ready to bring a great change into our lives with low cost. Why your home needs solar roof ventilation? As you know, proper ventilation is essential for maintaining an efficient and healthy environment in your home. Your existing roof vents have become too passive now to deliver 100% efficient performance, no need to worry. • These solar roof vents powered by natural solar light are all ready to improve the air circulation and ventilation of your roof. • Installing a solar powered fan is totally simple and cost-effective home improvement which you can afford. • This will definitely pay for itself in the long run, because solar roof vents, solar powered fan and solar roof ventilation solutions come with zero operational cost and they pay for themselves. If you are still not convinced and looking for some more compelling benefits of solar roof vents, we are here to bring you all the answers to your questions. Let’s get started and read on below to know more all about solar powered fans, solar roof ventilation with solar roof vents. These solar roof vents and solar roof ventilation solutions are guaranteed to not only lower the moisture level of your roof, but they largely help in decreasing the heat automatically. A solar panel is installed to provide support for vent fans. No doubt, ventilation is crucial at any cost and in any circumstance for maintaining a healthy working atmosphere in your home. As a concerned homeowner, you are always worried about the roof life of your home. Since the moisture improves the mold growth and it fastens the decaying process of your roof. Thus, the life of your roof gets compromised. A solar-powered fan not only regulates the temperature but protects your roof from dampness and moisture. So, invest in once and get stress free for a long time. The solar roof vents consume solar power so they save the electricity. Furthermore, this solar roof ventilation noticeably decreases the heat in your roof space. Since the solar roof vents are functional with natural solar light, so they can perform efficiently for a long time without using electricity. Solar powered fan is essential to maintain healthy ventilation. Moisture is accumulated in your roof space due to smoke and steam coming from various home activities such as cooking, bathing and etc. This moisture and heat have the potential to permeate your roof space. So, installing a solar-powered fan is the perfect solution in this scenario. It will not only decrease moisture and heat but will lower the expenses of general maintenance as well. With so many significant benefits, solar roof ventilation brings you another incredible advantage. During hot summer days, solar roof vents are capable of decreasing the load on your air-conditioning system and resultantly this saves your precious money also. In chilled snowy winters, these solar roof vents and solar roof ventilation systems provide your roof protection against ice clogging. This helps you save a lot of money and energy resources as well. We have surveyed the different manufacturers, and we can assure you that regular installation of solar roof vents can easily recover its expense in one or three summer seasons usage. This incredible and cost-effective solution for perfect ventilation of your roof comes directly from the hands of nature. If you have already suffered in those hot and brutal summer days with increased uncomfortable temperature in your home, you must trust this solar roof vent now. This amazing equipment comes with a responsibility of extracting heat and warm air away from roof space of your home. Best of all, these solar roof vents are not dependent upon electricity or wind-generated power, instead, they use free of cost solar energy. This solar roof vent technology is not only a quiet, natural and efficient cooling system but it comes with a built-in automatic shutdown mechanism. This helps your solar roof vent to instantly stop functioning if a pre-set roof temperature is indicated. This majorly helps you to trap the heat inside your roof space during icy cold winters. In the end, we suggest you bring some change in your lifestyle. As they say, changes are always good. So invest your money once in these solar roof ventilation solutions and solar roof vent, and let nature do its wonders. You will not be disappointed by the countless benefits of solar roof vent.